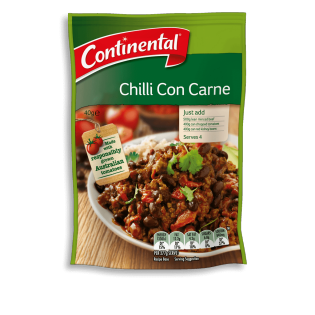 Continental's chilli con carne is made with onion, paprika & sustainably grown Aussie Tomatoes. Learn how to create this perfectly balanced dish here. Corn starch, vegetable powders [tomato ^(20%), onion), natural flavours (contain wheat), sugar, mineral salt (potassium chloride), paprika, salt, maltodextrin, yeast extract, sunflower oil, vegetable gum (xanthan), garlic extract, spice extracts. ^ From responsibly grown tomatoes. Contains naturally occurring glutamates.